Legacy Building Solutions has combined decades of experience with an uncompromising vision for innovation to provide the very best technology the tension fabric building industry has to offer. We design, engineer, manufacture, supply and install custom building solutions that have taken fabric clad structures to a new level of quality and performance. In addition to designing customer-specific fabric building solutions, Legacy delivers on tight timelines and provides a professional and experienced in-house installation team. Innovation is the driving force behind the people and the products. Utilizing our team’s unique talents and a century of combined tensioned fabric steel frame industry experience, we deliver clear span structures with the flexibility to meet the precise needs of our clients’ applications. At Legacy, we pride ourselves on designing your customized fabric building to accommodate your exact needs. We start every project by listening to the customer. From there we design your fabric building to the exact width, length, eave height, peak height and roof pitch you require. Wider, taller and uniquely shaped buildings are not a problem. We can design structures with offset peaks, multi-level legs, sidewall dormers, lean-tos and even mono-slope roofs. Every Legacy tension fabric building system is unique – we have no standard sizes. The Legacy team pioneered and developed the concept of applying tensioned fabric panels to a rigid steel frame structure. This superior design and structural engineering expertise allows Legacy to supply buildings to meet demanding environmental conditions and performance requirements. Wider, taller, unique roof-line shape, high snow and / or wind loads, seismic and ancillary loads are standard opportunities for our custom, application-driven designs. At Legacy, the building’s operational needs are met with choices for the steel frame finish, including factory-applied primers and hot-dipped galvanized, powder-coated or specialty coatings. To further enhance the added value of a Legacy building solution, we design and manufacture our fabric cladding panels and covers utilizing up to 20 year-warrantied FR (flame resistant) PVC and HDPE fabrics. For projects that are dependent on application-specific performance design, prompt delivery and quality installation services around the world, Legacy Building Solutions’ technical expertise and building systems lead the way. Our structures are custom-designed to meet or exceed the building codes and standards of each client’s site. A Legacy design allows variation in three dimensions so we can accommodate almost any building requirement. Ancillary equipment loads such as conveyors, cranes and fire suppression are all viable in a Legacy-designed structure. Processing, including sorting, packaging, bulk storage, surge pile covers, transfer storage piles and infrastructure weather protection are a few of the applications we can provide engineered solutions for. Operations facilities such as haul truck maintenance, workshops, garages, batch plants and warehousing often require the large door access or tall side-wall requirements that a Legacy Building Solution can provide economically and on time. The Legacy team features an in-house engineering, drafting and design department that allows us to deliver innovative solutions for your fabric building needs. We use cutting-edge metal building design software to develop our superior quality rigid frame fabric structures. Our building frames are also referred to as three-plate frames, tapered section frames and tapered member frames. Our thorough engineering process always accounts for the fabric pressure, or fabric tension, that is applied to the frames. All our fabric structures comply with International Building Code (IBC) standards and principles enforced by the National Institute of Standards and Technology (NIST). 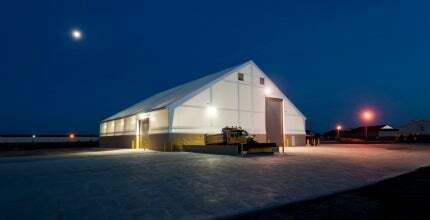 Legacy fabric structures are installed by our own in-house crews, building experts who are specifically trained to erect tension fabric buildings. Unlike fabric building companies that subcontract installs, Legacy understands the critical need that structures be professionally installed and completed on schedule. With over 17 years of experience and ongoing training, our crews are a large part of the Legacy building solution. We offer installation services worldwide. Please contact us for examples and references of our superior service. Legacy Building Solutions, a premier manufacturer of custom fabric structures is pleased to announce the addition of Eric Donnay as vice-president of sales. By combining the strength and versatility of structural steel with the proven benefits of a fabric membrane, Legacy Building Solutions is proud to offer customised structures built to your exact requirements. Legacy Building Solutions combines the strength and versatility of structural steel with the proven benefits of a fabric membrane to provide customised structures built to client's exact requirements. Corrosion is the deterioration of metal caused by the reaction of metal with the environment. The word corrode means to gnaw to pieces. Legacy Building Solutions is proud to announce the addition of a new and exclusive fabric, ExxoTec™, to their customised tension fabric structure offerings. Legacy Building Solutions has been named to the Inc. 5000 list of fastest-growing private companies in America for the second year in a row. The company is ranked 2,824 on the 2017 list. Fabric structure to hold 20,000t. New addition offers a comprehensive solution to building project requirements. Legacy Building Solutions can have a fabric structure for frac sand storage designed, manufactured and installed in just a few weeks. Central Valley, a wholesale and retail distributor of fertilizer in Tamora, Nebraska, US, needed to replace a storage building that was damaged by rust and wind. Mining operation sites are some of the world's most demanding, with any delays or inefficiencies resulting in financial losses. Legacy Building Solutions has recently been ranked on the Engineering News-Record Top 600 Specialty Contractors list for the third year in a row. Legacy Building Solutions has announced that it has earned the position of 1952 on the 2016 Inc. 5000 fastest-growing private companies in America. Legacy Building Solutions is constructing a full-scale, stand-alone fabric structure completely inside the Las Vegas Convention Centre for MINExpo. During the summer months, keeping cool is a challenge for industry environments. Legacy Building Solutions provides the solution. Legacy Building Solutions is proud to announce the Solar Ship Brantford off-grid hangar, a joint venture with Canadian Energy and Solar Ship Inc, has been awarded the 'Game Changer Project of the Year' by Canadian Solar Industries Association (CanSIA). With the award for Solar PV Project, CanSIA recognizes the hangar for using a reliable and cost-effective system that advances the future of building-integrated distributed generation. Legacy Building Solutions designs, engineers and manufactures custom building solutions for mining clients. Legacy Building Solutions, a leading designer, manufacturer and installer of tension fabric buildings, has opened a new satellite office in Santiago, Chile. Legacy Building Solutions is Holding a panel and live Q&A webinar on Building for Highly Corrosive Environments: How Fabric Structures Outperform. Legacy Building Solutions has released the Legacy Mining, Oil and Gas brochure as a free download on Mining Technology.